While world leaders grapple with setting binding targets for CO2 emissions at the Copenhagen Climate talks next week and scientists call for up to 90% cuts, a small building project in West Yorkshire is demonstrating how these tough targets could easily be met by the majority of UK homes and buildings. The Denby Dale Passivhaus, currently under construction, will require minimal heating and will use 90% less energy to heat1 than the UK standard. Passivhaus design is already popular in continental Europe but is still relatively unknown in the UK. The Denby Dale Passivhaus will be one of the first certified Passivhaus buildings in the UK and is expected to be the first to be built in the UK using traditional cavity wall construction. The Denby Dale Passivhaus is currently being built for private clients in the village of Denby Dale, West Yorkshire by Green Building Store‘s construction division – Green Building Company. Passivhaus buildings can achieve 90% cuts in heating bills for their occupants, with the heat generated from the sun through windows, occupants’ (and pets’!) body heat, cooking and showering activities often all that is needed to warm a Passivhaus home. Built to a tight budget of £140K, the 118m2 three-bed detached house aims to be an exemplar of how Passivhaus construction can be achieved inexpensively by a small, skilled construction team. Passivhaus design was first developed in Germany almost 20 years ago and is based on well researched and proven building physics. Instead of complicated design and expensive bolt-on renewables, Passivhaus design relies on a simple ‘tea cosy’ effect of maximising the use of super insulation and stringent levels of airtightness. By combining this with optimum levels of ‘passive’ solar gain and mechanical ventilation and heat recovery systems, Passivhaus design can create healthy and comfortable buildings that require minimal heating. 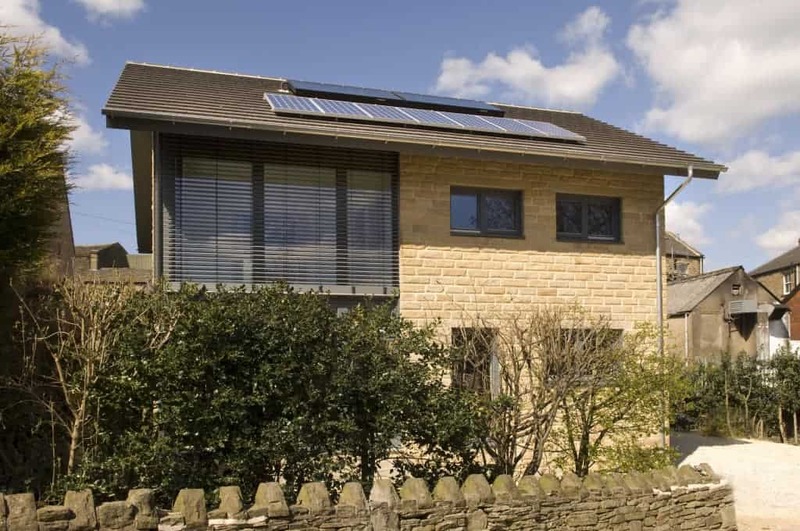 Buildings (in construction and use) are responsible for a massive 50% of all UK CO2 emissions2 but this is also the sector where radical action is most easily achievable, as the Denby Dale Passivhaus demonstrates. Building and retrofitting buildings to Passivhaus standards would also offer politicians a relatively ‘easy win’ as few voters would object to cosier homes and vastly reduced fuel bills, as opposed to the radical changes needed in the more controversial transport and aviation sectors. Unlike the overwhelming majority of buildings currently being constructed, the energy consumption of Passivhaus buildings is carefully modelled and monitored, providing politicians with concrete evidence of reduction of CO2 emissions. Unless low energy buildings are properly monitored and measured, politicians will never know, and would not be able to say with any confidence, whether CO2 targets in the building sector are being met. 1. Passivhaus houses use around 90% less energy for space heating than the average UK home (15 kWh/m2/annum, as opposed to 139 kWh/m2/annum for average dwelling stock). Average UK dwelling stock uses energy at rate of 278 kWh/m2/year with space heating making up 50% of all domestic energy use. 2. Aviation figures not included in calculation. Green Building Store believes that urgent action is needed to integrate Passivhaus standards into UK targets for low and Zero Carbon buildings in the UK, through the Energy elements of Code for Sustainable Homes and upcoming revisions of the Building Regulations. According to Bill Butcher, Green Building Store Director and project leader at the Denby Dale Passivhaus “We believe that the Code for Sustainable Homes in its current form (and in particular SAP 2005) is proving an obstacle to the introduction of Passivhaus buildings in the UK, as it is not sophisticated enough to accurately predict the actual energy use of Passivhaus and low energy homes. We would like CSH to replace SAP with the much more accurate Passivhaus Planning Package (PHPP) as its energy calculation methodology”. Green Building Store is among a growing number of organisations that are convinced that Passivhaus building design is the direction that the UK construction industry (and the world) needs to be moving in. Tried and tested in over 10,000 buildings (homes, schools, factories etc) in continental Europe over the last 20 years, Passivhaus design has also recently gained some heavyweight support. On January 31 2008 the European Parliament passed a resolution in which it called on the Commission “to propose a binding requirement that all new buildings needing to be heated and/or cooled be constructed to passive house or equivalent non-residential standards from 2011 onwards”. The AECB – also known as the sustainable building association – is also a vigorous supporter in the UK and offers a comprehensive training programme in Passivhaus design through its CarbonLite Programme (www.aecb.net). The AECB has calculated that if the UK adopted its standards (based on Passivhaus principles) wholesale then in 2050 domestic buildings, instead of producing 33 million tonnes of carbon dioxide each year would only produce 3.3 million tonnes. (Source: AECB Yearbook – The Sustainable Building Guide 2006/7). Established in 1995, Green Building Store is a specialist manufacturer/ supplier of: FSC timber windows and doors; water-efficient toilets and sanitaryware; Passivhaus products; and natural building materials. Founded by three experienced building professionals Bill Butcher, Chris Herring and Steve Slator, the company grew out of their frustration with the poor availability of ecological building products. The company is committed to doing all it can to help tackle climate change and to act as a centre of excellence, championing best practice in low carbon and sustainable construction. Green Building Store is based in Heath House Mill, Bolster Moor, Golcar in the hills above Huddersfield. Bill Butcher, project leader of the Denby Dale Passivhaus will be taking part in the Big Debate ‘ Is Passivhaus right for the UK’ during the Sustainability Now online conference on Wednesday 9th December 2009. First UK Passivhaus to be built with cavity wall construction and one of the first certified Passivhaus homes in the UK.